Planning a trip to Walt Disney World this year? There are many factors that come into play when choosing the dates for your vacation. This article looks to identify the best times to plan your vacation to Walt Disney World based on historical crowd levels at the parks—because who doesn’t want to avoid massive crowds at Disney World? The first step in discovering the best dates for your upcoming trip is to consult multiple Walt Disney World Crowd Calendars. These calendars detail by week and date the predicted number of people who will be vacationing to Disney World based on historical data and trends. You can also read my in-depth article on Disney World Crowd Calenders here. A great all-around resource, The Undercover Tourist creates an easy to read calendar with simple Red, Yellow, and Green days to indicate crowd levels and Check Marks next to recommended parks for that day. Undercover Tourist will also make note of the weather and any special events that may be happening each day, such as a holiday or Mickey’s Not So Scary Halloween Party. You can also filter information on the top of the page, allowing you to focus on what is important to you. Undercover Tourist publishes their calendars up to a year in advance, much earlier than other resources, so this is a great place to start! I grouped these two together as they both provide a great general overview on how the crowd levels will fluctuate throughout the current year. If you are a more visual person, Dad’s Guide To WDW creates simple calendars that make it very easy to pinpoint low and high crowd levels, while providing relevant and witty commentary about key events affecting crowds. 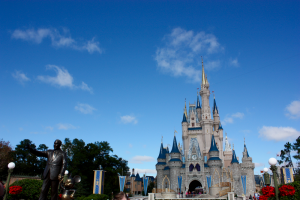 Easy WDW provides a written overview by month for the current year, detailing each month’s crowd levels, refurbishments, events, and any other relevant information. This website also publishes monthly crowd calendars about one month in advance which can be useful to reference before you leave for your trip! An amazing all around resource for all things Mickey Mouse, the Disney Tourist Blog provides an overview of the types of crowds you can expect at Walt Disney World by month. 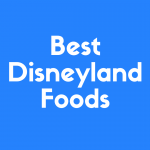 Tom Brickner, the author of the blog, also provides in depth information on restaurants, attractions, special events, and recommended touring plans. 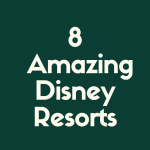 This website is an invaluable resource when planning a Walt Disney World vacation. A Disney veteran, Kenny uploads his Crowd Calendars about 6 months in advance. From each month’s individual page, you can view recommended parks by date. More detailed than Undercover Tourist, Kenny classifies the Disney Parks each day as “Best Park,” “Median Park,” and “Worst Park” making itinerary planning much easier. These calendars also include parade and firework showtimes, park hours, and even 180-prior, 90-prior, and 60-prior dates for dining and Fastpass+ reservations. Kenny also offers an incredibly useful Character Meet & Greet Locator and Touring Plan for a small fee on his website. The ultimate in Walt Disney World Planning, TouringPlans.com uses their massive database of Disney World guest attendance dating back to 2009 to predict crowd levels by park, date, week, month, and year. Important to note, this website charges about $12.00 per year to access it’s information. Touring Plans creates a page for every day at Walt Disney World. Detailing the overall crowd level, crowd level by individual park, park operating hours, park parade and show times, this website provides the most in depth information out there for Walt Disney World vacation planning. On the page for each date, there are even links to click into to view average attraction wait times by hour for the specified crowd level that day—(we know, it’s insane). When you combine the detailed crowd information with it’s amazing park touring plan creator and attraction wait time predictor, this website can save hours of waiting in long lines. They even created an app called “Lines” which provides real-time updates to current wait times and saves the plans you spent so much time creating right to your smartphone for easy access while touring the parks. These Crowd Calendars are listed in the order that I recommend using them. The first two provide overviews to help readers decide on a general time of year or month to visit Walt Disney World, and the second two calendars provide invaluable detailed advice to shape the best daily itineraries to avoid seemingly endless queues at healing attractions. Utilizing the resources listed above, I have compiled a list of the very best times to visit Walt Disney World for low crowd conditions at the parks. Why? : Low Crowds, Mild Temperatures, and Low Resort Prices make these weeks excellent for a Walt Disney World Vacation. Visitors during this time period will enjoy low wait times at major attractions following the Christmas Break rush. Important to Note: Refurbishments on popular attractions and Resort Pools are common this month. Why? : Outside of President’s Day Weekend, the rest of February features some of the lowest crowd levels of the year. Resort Prices are at some of their lowest points for the year, and temperatures are mild. Visitors during this time period will enjoy low wait times at major attractions. Why? : Beat the heavy Spring Break crowds during the first week of March. EPCOT’s amazing Flower & Garden Festival kicks off, featuring special fresh food and drink items, daily concerts, and special events. Temperatures begin to warm up this month, and most major attraction refurbishments come to an end. Why? : The lull between Spring Break Crowds and Summer Crowds is one of the best times of year at Walt Disney World. Moderate crowd levels and nice weather will be plentiful. EPCOT’s Flower & Garden Festival finishes up in the middle of May. Why? : Fall in Walt Disney World means low crowd levels, beautiful weather, and low WDW Resort Prices. This is my favorite time of year to visit. EPCOT’S Food & Wine Festival kicks off in August. It is a magnificent event featuring unique dishes from around the world, special culinary experiences, and a daily concert series. Mickey’s Not So Scary Halloween Party starts in September, and is fun for all ages; putting on special Halloween themed parades, spooky shows, stunning fireworks, and exclusive character meet & greets. Why? : November kicks off the Christmas Season at Walt Disney World. The day after Halloween, stunning Christmas decorations will go up. Mickey’s Very Merry Christmas Party will begin on the first Friday of November. The first two weeks of the month will make for a wonderful Walt Disney World vacation. Crowds are low and EPCOT’s Food & Wine Festival is still going on, adding up to an exciting and stress free trip. Why? : According to Dad’s Guide to Walt Disney World, the first half of December is the best time of year to plan a Disney World vacation. The stunning Christmas decorations, low crowd levels, and mild temperatures will make for some of the most magical vacations. Resort prices remain low for the first half of this month. Mickey’s Very Merry Christmas Party continues through this month, a magical special ticketed event featuring holiday parades, festive fireworks, and special character meet & greets. According to historical crowd calendars, the time periods explained below are some of the most at Walt Disney World. Careful early planning is recommended to make the most of trips during these times of year. All Disney World trip planning resources agree: the week between Christmas and New Year’s is notorious for wall-to-wall crowds, high resort prices, and wait times north of 3 hours at popular attractions. By far, this is the most crowded time of the year at Walt Disney World, and I recommend avoiding traveling during the second half of the month. Christmas Day and New Year’s Eve are the two single most crowded days of the year. Some parks will reach capacity and are subject to closures. Following the first week of March, Spring Break Season quickly ramps up at Walt Disney World. Easter week is the second most busy week of the year to visit the parks. Expect heavy crowd levels everyday during this time period, and inflated WDW Resort prices. By midday, expect attraction wait times of an hour or more everywhere, with waits at major attractions approaching 3-4 hours. Extensive planning is crucial for a trip planned during this time of year. Thanksgiving Weekend will draw some of the heaviest crowds of the year. Traveling over this weekend will require thorough itinerary planning and smart use of Advanced Dining Reservations and Fastpass+ Selections. WDW Resort prices reach some of their highest of the year over this weekend due to its condensed time frame. Many families utilize the long President’s Day weekend to bring their children to Walt Disney World. This creates an influx of visitors in a short period of time, resulting in heavy crowd levels, tapering off towards the end of the week. Summer Break season creates the longest period of steady, heavy crowds at Walt Disney World. Temperatures are sweltering during this season, making the heavy crowds even more unbearable. Daily chance for precipitation reaches its highest level of 49%, and WDW Resort prices are higher than lower crowd time periods. When touring the parks during this time of year, early morning touring can make a huge difference in the experience you have at Walt Disney World. Sometimes, the best time for you and your family to visit Walt Disney World falls during one of the heavy crowd periods described above. I am a firm believer that it is still possible to plan an enjoyable vacation during these weeks. The tips below will make a huge difference in the quality of your Disney World vacation during a high crowd season. Stay On-Site: Staying at a WDW Resort will allow you to book Fastpass+ choices 60 days prior to your arrival date. This is 30 days before Fastpass+ windows for off-site guests open. During heavy crowd days, Fastpass+ options for popular attractions will be completely booked at the 30 day mark. On-Site transportation will save a lot of time traveling between parks and resorts. Extra Magic Hours, when parks open an hour early or stay open two hours late exclusively for On-Site Guests can help you fit in everything you would like to accomplish during heavy crowd days. Early Park Touring: The first few hours following “Rope Drop”, which means park opening in “Disney Language,” will feature dramatically lower wait times than the afternoon and evening hours at the parks. I recommend touring parks when they open through lunch time, returning to your resort for a midday break, and then heading back into the parks at night for fireworks and a few more attractions. It is possible to accomplish what would encompass an entire afternoon in the first hour following “Rope Drop”. Use Fastpass+ Wisely: Reserve your first three Fastpass+ choices at the 60 day mark if you are on-site and at the 30 day mark if you are off-site. Research wait times for attractions you are most excited to ride, and prioritize your choices based on attractions with the longest wait times. Reserve your first three choices in the morning so that you can reserve a fourth early on in the day. Extra Fastpass+ options disappear quickly on high crowd level days. Be sure to research the tiered Fastpass+ structure at EPCOT and Hollywood Studios, Touring Plans provides an excellent explanation. Reserve Dining 180 Days in Advance: Try to walk into Walt Disney World’s most popular restaurants on a crowded day without a reservation and prepare to be turned down. Advanced Dining Reservations open up at 6:00AM 180 days before your arrival date. For trips planned on high crowd level days, I recommend reserving all table service meals you may want to have at this point. It is always possible to cancel or modify for no fee up to 24 hours in advance. From my experience, it is always better to call WDW Directly rather than use the online reservation tool which often experiences technical difficulties. 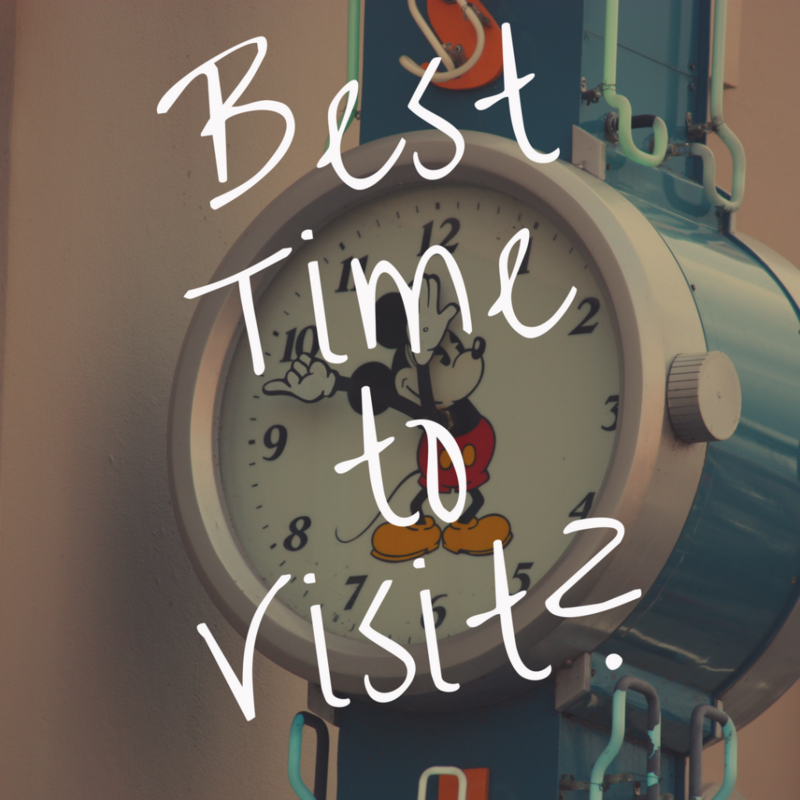 Utilize trip planning resources like Touring Plans: I cannot stress enough how useful these tools are when planning a Walt Disney World Vacation. Their help becomes even more crucial when planning for high crowd level days. Creating an itinerary based on years of historical crowd data saves hours of waiting for major attractions. January brings cooler temperatures and shorter park hours to Walt Disney World. The coolest month of the year, the average high is only about 70 degrees, with average lows around 50 degrees. January is a very common time for refurbishments that close popular attractions, and water parks are almost always closed this month. The second half of January features one of the lowest price seasons of the year in WDW resorts. The first few days of January will see residual crowds from the Christmas Holiday rush. In fact, Undercover Tourist noted January 1-8 as one of the worst times to plan your trip this year. The rest of January has some of the lowest crowd levels of the year, with two exceptions. Marathon Weekend takes place over the second weekend of the month, drawing moderate to heavy crowds as thousands flock to Walt Disney World to take part in the annual race. The Martin Luther King holiday shows slightly elevated crowd levels, but not nearly as bad as Marathon Weekend, and definitely manageable with the right touring plan. You can read our January Crowd Calendar article right here. Best time to visit in January: The last two weeks of January are ideal for an enjoyable and relaxed vacation without the heavy crowds often seen in the beginning of the month. January 1st & 2nd will be among the most crowded days of the year due to many school breaks extending through this week. Christmas decorations will remain in place through the first week of January. Marathon Weekend during the second week of January produces heavy crowds. Martin Luther King Weekend will bring moderate crowds. With the exception of President’s Day Weekend, February is one of the quieter months of the year in Walt Disney World. It is common for longer attraction refurbishments from January to continue into the beginning of February, and temperatures remain on the milder side for Orlando. Easy WDW, The Undercover Tourist, and Dad’s Guide to WDW all note the first few weeks of February as among the best choices for a Disney World vacation. Cheerleading competitions are common this month, which cause only a marginal increase in overall crowd levels. The Princess Half Marathon occurs at the end of President’s day weekend, but most of the holiday rush will be over and overall crowd levels are unaffected. If President’s Day Weekend is the best time for you to visit Walt Disney World making smart use of FastPass+, getting to the parks early, and reserving dining 180 days in advance will help make a trip during this week more enjoyable. Consult our tips for visiting during the most crowded times of the year below. You can read our February Crowd Calendar article right here. Best time to visit in February: Lower crowds, low wait times for attractions, and cooler weather make the first half of February among the best for a visit Walt Disney World. The first week of March continues the calmer atmosphere from February, before quickly ramping up into the busy Spring Break season at Walt Disney World. Temperatures begin to warm up, reaching highs of 80 degrees. Major attraction closures are less frequent from this point forward, although many resort pools will remain under refurbishment. WDW Resort prices will climb following the first week of the month, reaching some of their highest points of the year. EPCOT’s Flower & Garden Festival kicks off around March 2nd, featuring gorgeous topiaries, colorful gardens, concerts, special events, and unique food & drink selections around the World Showcase. This festival will bring more crowds to EPCOT on nights and weekends due to its popularity among locals and tourists alike. Beginning around March 8th and continuing through the end of April, Spring Break crowds flock to Walt Disney World for family vacations before the Orlando sun heats up for the summer. Undercover Tourist marks Spring Break period as one of the very worst times to visit WDW, second only to the week before Christmas. You can read our March Crowd Calendar article right here. Best Time To Visit in March: By far, the first week of the month is the best time to visit Walt Disney World. Crowds will be low, the Flower & Garden festival will be in full swing, and temperatures will be comfortable. The Flower & Garden festival begins on March 2nd, bringing beautiful springtime festivities to EPCOT. Heavy crowds will continue through the first half of April. Easter week is the second most busy of the year to visit Walt Disney World. EPCOT’s Flower & Garden Festival remains popular, delighting visitors with beautiful topiaries, gardens, special treats, special events, and the Flower & Garden Concert Series. Temperatures continue to warm up this month but remain mild for Orlando, with highs in the 80s and lows in the 60s-70s. Resort pool refurbishments are common during this month. WDW Resort prices remain high through the Spring Break Season. Sometimes, the only time that works for a Walt Disney World is during a heavy crowd time period. If this is the case, and you will be visiting during the first half of April, be sure to utilize resources like Touring Plans to help plan your itinerary. These resources make all the difference in enjoying a trip during this time of year. Also see below my tips for planning a trip during heavy crowd periods. Fastpass+, Advanced Dining Reservations, and early morning park touring will be invaluable. You can read our April Crowd Calendar article right here. Best Time To Visit In April: The last week of April is generally the best time to visit Walt Disney World. Compared to the heavy crowds surrounding Easter and Spring Break, crowd levels are moderate. The warm but comfortable temperatures and the Flower & Garden festival make this week a great time for a Walt Disney World Vacation. The Easter Holiday brings some of the heaviest crowds of the year to Walt Disney World. EPCOT’s Flower & Garden Festival continues through April. Following the Spring Break rush, the majority of May sees average crowds and warming temperatures. Afternoon thunderstorms are common from this month through the summer. Resort pool refurbishments will finish up, and water parks will begin to draw crowds. EPCOT’s Flower & Garden Festival will run through the first half of May, finishing up by the third week of the month. WDW Resort prices fall from inflated Easter and Spring Break points, making May an affordable month for a Walt Disney World Vacation. Weekends are more crowded in May. Memorial Day will cause a slight increase in crowds, but will not affect overall wait times too much. You can read our May Crowd Calendar article right here. Best Time To Visit In May: As the month goes on crowds will gradually increase. 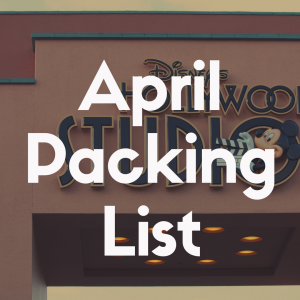 However, most of May sees moderate crowds and the entire month is a great time to plan a Walt Disney World Vacation. EPCOT’s Flower & Garden Festival will end in the middle of the month. Cinco De Mayo on May 5th will cause a small increase in crowd levels. Memorial Day Weekend will see a slightly elevated crowd level. June marks the beginning of the Summer Season at Walt Disney World. As schools begin summer recess, families flock to Walt Disney World for summer vacation. Temperatures climb to an average of 90 degrees, and the daily chance of precipitation is around 38%. Resort prices will be lower than the busiest weeks of the year, but are elevated from the lowest crowd level prices. Following the first week of June, crowds will gradually become larger and remain heavy for the rest of the summer. I strongly recommend early morning park touring during June to avoid afternoon thunderstorms, long wait times, and the hot Orlando sun. There is nothing like escaping the crowds to head back to your resort for a refreshing afternoon swim after spending a morning riding your favorite attractions with low wait times. Return to the parks in the evening for cooler temperatures and fireworks. 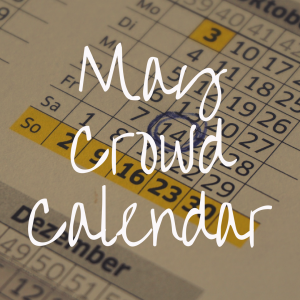 You can read our June Crowd Calendar article right here. Best Time To Visit In June: By far, the first week of June is the best choice for a Walt Disney World Vacation. The majority of schools will still be in session this week, so you will beat the rush that begins at the end of the month. EPCOT’s Summer Concert Series will begin around June 5th. Featuring cover bands singing songs from popular artists, this series is always an exciting event to catch outside the American Adventure pavilion in the World Showcase. Summer Vacation season is in full swing by the beginning of July. Overall, this is busiest month to visit Walt Disney World. July is marked by heavy crowds and hot temperatures. High temperatures will each at least 90 degrees each day, with lows around 75 degrees. Bring your ponchos, the average daily chance for precipitation is 49%. WDW Resort Prices remain elevated this month. Like in June, early morning park touring will give you a huge advantage in July. You will beat the intense afternoon sun by touring your favorite attractions at “rope drop”, which in Disney language means park opening. 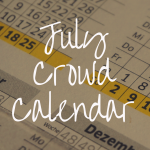 You can read our July Crowd Calendar article right here. Best Time To Visit In July: July brings a steady flow of heavy crowds to Walt Disney World. No matter which week you plan your vacation, you will experience elevated wait times and crowded park conditions. The first week is probably the one to avoid, as Independance Day will raise crowd levels more. I recommend the second half of the month over the first half, but as I noted, crowds will still be high. If this is the best time for you to visit WDW, taking the time to create touring plans will help you to have a great vacation despite heavy crowds. July 4th will bring some of the heaviest crowd levels to Walt Disney World. Guests visit to experience the magnificent special fireworks displays put on at night. The first half of August continues the heavy Summer Vacation crowds from July. During the second half of the month, the crowds will begin to disappear, but the heat does not. High temperatures will remain in the upper 80s to low 90s everyday. WDW Resort prices remain elevated. Crowd levels fall dramatically towards the end of the month as children go back to school. Undercover Tourist marks the second half of August as among the best time periods to plan a Walt Disney World vacation. New this year, EPCOT will begin it’s Food & Wine festival during the last week of August, making this an even better time to plan your Disney vacation. Like June and July, early park touring is strongly recommended this month to avoid sweltering temperatures and afternoon thunderstorms. You can read our August Crowd Calendar article right here. Best Time To Visit In August: The second half of the month is one of the best times to visit Walt Disney World. Featuring low crowds, warm temperatures, and the amazing Food & Wine Festival in EPCOT, you are sure to have an exciting and relaxing vacation. By the first week of September, schools across the country are back in session, bringing the crowd levels down to some of the lowest of the year. Resort prices will drop, and there are often Free Dining Plan Promotions during this month. It will be Hurricane season, and even though it is rare for a hurricane to hit Orlando, I recommend taking out travel insurance for trips planned this month. Temperatures begin to cool off as the month progresses, and EPCOT’s Food & Wine Festival is in full swing. Weekend crowd levels at EPCOT are increased, but overall attraction wait times are still low. Mickey’s Not So Scary Halloween Party kicks off in the first week of September. This is a special ticketed Halloween Celebration taking in Magic Kingdom featuring festive parades and special character meet & greets. Low crowd levels, cooling temperatures, and exciting special events make September an excellent time of year to plan a Walt Disney World Vacation. You can read our September Crowd Calendar article right here. Best Time To Visit In September: The entire month of September is excellent for a Walt Disney World vacation. If I had to choose the best week it would be the second week. Any Labor Day weekend vacationers will go home, and all schools are back in session, making for a quiet and relaxing trip. Labor Day Weekend: The holiday will bring slightly elevated crowd levels to WDW. Night Of Joy: Christian music festival during the first week of September that should not have much effect on crowd levels. Food & Wine Festival: Continues throughout September, causing marginal increased crowd levels in EPCOT on the weekend. Mickey’s Not So Scary Halloween Party: Beginning in September, Magic Kingdom will close to guests without tickets to this special event at 7pm a few nights per week. Overall crowd levels will not be affected. Cooling temperatures and spooky decorations make fall a popular time to visit Walt Disney World. According to Undercover Tourist and Touring Plans, most of October will feature moderate crowd levels. Resort prices will remain at some of their lowest of the year. As Halloween approaches, Mickey’s Not So Scary Halloween Party draws more and more crowds. Weekdays are generally much less crowded than weekends. EPCOT’s Food & Wine Festival continues throughout this month. There is still a risk for Hurricanes this month, and travel insurance is recommended. You can read our October Crowd Calendar article right here. Best Time To Visit In October: While most of this month will have similar crowds, I recommend the first half of the month over the second. Warm temperatures, low crowds, and special events make this a great time to plan your Walt Disney World Vacation. Mickey’s Not So Scary Halloween Party: Multiple nights per week Magic Kingdom will close to guests without tickets at 7pm. As Halloween approaches, these parties become increasingly more busy. Tickets will sell out well in advance towards the end of the month, purchase yours early if you plan to attend. Halloween: This holiday will cause a slight increase in crowd levels in some parks, and will bring heavy crowds to Magic Kingdom during MNSSHP. Columbus Day: This holiday will not have much of an affect on overall crowd levels. EPCOT’s Food & Wine Festival: Continuing through this month, the Food & Wine Festival will bring moderate crowd increases to EPCOT on the weekends. November kicks off the Christmas Season at Walt Disney World. The day after Halloween, stunning Christmas decorations will go up, and Mickey’s Very Merry Christmas Party will begin on the first Friday of November. Crowds will be low throughout most of November, with the large exception of Thanksgiving Weekend. Temperatures will be mild, and the risk for hurricanes significantly decreases this month. Resort prices will be low throughout most weeks besides the busy Thanksgiving holiday weekend. Thanksgiving Weekend will draw some of the heaviest crowds of the year. Traveling over this weekend will require thorough itinerary planning and smart use of Advanced Dining Reservations and Fastpass+ Selections. I strongly recommend utilizing detailed itinerary planning resources like Touring Plans to help create daily plans to avoid parks on their most crowded days. You can read our November Crowd Calendar article right here. The Best Time To Visit In November: The first two weeks of November will make for a wonderful Walt Disney World vacation. Crowds are low, Christmas decorations are up, and the Food & Wine Festival is still going on, adding up to an exciting and restful trip. Thanksgiving Weekend: One of the most crowded times of the year at Walt Disney World. Mickey’s Very Merry Christmas Party: Magic Kingdom will close early to guests without tickets to this special event on party nights. The party will run multiple nights per week throughout the holiday season. EPCOT’s Food & Wine Festival: The festival will wrap up in the middle of November. According to Dad’s Guide to Walt Disney World, the first half of December is the best time of year to plan a Disney World vacation. The stunning Christmas decorations, low crowd levels, and mild temperatures will make for some of the most magical vacations. Resort prices remain low for the first half of this month. During the second half of December as Christmas vacation approaches, crowd levels grow massively reaching epic levels. All Disney World trip planning resources agree; the week between Christmas and New Year’s is notorious for wall-to-wall crowds, high resort prices, and wait times north of 3 hours at popular attractions. You can read our December Crowd Calendar article right here. The Best Time To Visit In December: The first two weeks of the month are among the best choices for a Walt Disney World Vacation with low crowd levels. Christmas Day & New Year’s eve: The two single most crowded days of the year. Mickey’s Very Merry Christmas Party: Magic Kingdom will close early to guests without tickets to this special event on party nights. The party will run multiple nights per week throughout the holiday season. Dates closer to the holiday will sell out well in advance, buy tickets early.